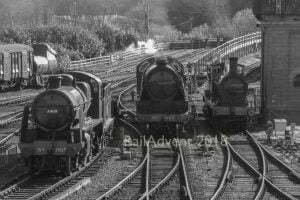 This week’s Class Information will be looking at the Southern Railway Bulleid Pacifics, the Merchant Navy, West Country & Battle of Britain classes. After looking into the history of both classes, we will then move onto see which engines have been preserved, and what’s their current condition. By the late 1930s, the Southern Railway’s (SR) steam locomotive fleet had fallen behind the other three companies of the ‘Big Four’. 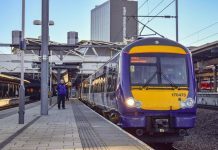 The new Chief Mechanical Engineer, Bulleid, was set the task of designing a new locomotive capable of hauling the heaviest express trains, but could also be used on freight trains as well. After the Chief Civil Engineer rejecting an engine with a 4-8-2 or 2-8-2 wheel arrangement, a 4-6-2 wheel arrangement engine was accepted. 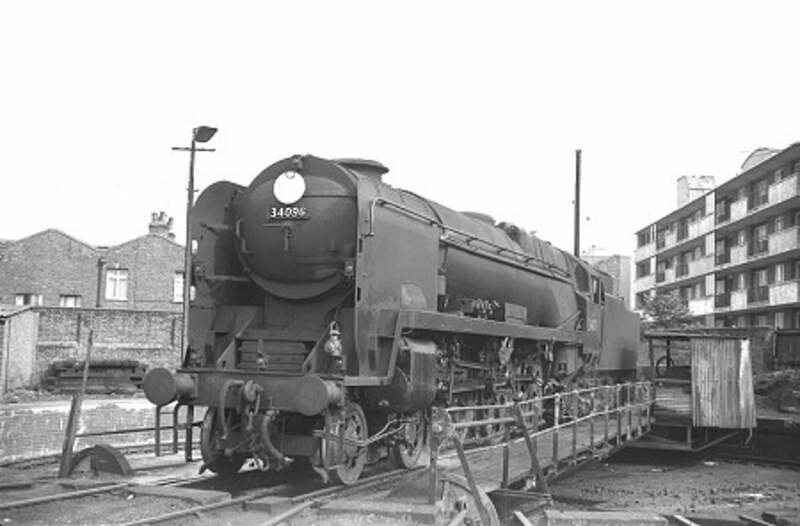 The Merchant Navies featured many new building techniques and components types, which includes the following: chain valve gearing – designed by Bulleid; Bulleid steam reverser; thermal syphons; Bulleid firth brown (BFB) wheels, heavy uses of Wielding in construction and air-smoothed sheet-steel casting for the boiler. Most of these features were a first for a British designed and built engine. The air-smoothed casting gave the class a distinctive look, and also gained the class the nicknames “Spam Cans” and “Packets”. 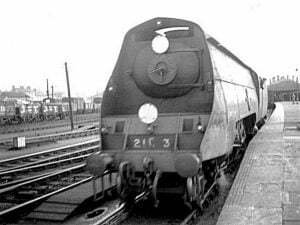 On paper, the class was a mixed traffic type of engine, but this was mainly done so the order for the new engines would be accepted due to wartime restrictions, as they were mainly used on the top express passenger trains when built. The class received names after the shipping companies that used ports in the Southern Railway territory. Initially, a batch of 10 engines was ordered straight off the board, without much trialling work to the new features. These were built at Eastleigh Works, apart from the boilers which were constructed by another company. 21C1 “Channel Packet” was the first engine built and turned out in SR Malachite Green with Sunshine Yellow lining. This engine ran for a period of four months before the next engine, 21C2 “Union Castle” appeared. In this time 21C1 underwent various trials and modifications to test and improve the design. One of the early issues found was weight, this being the engine was significantly overweight. The Chief Civil Engineer halted further construction until the weight had been reduced. This was achieved by using thinner steel and using wider lightening holes in the frame. Between September 1941 and July 1942, construction of 21C3 to 21C10 had been completed. Next, another 10 engines formed the second batch. Fitted with slightly bigger 5,100 UK Imperial Gallon Tenders, the building of this batch solely took place at Eastleigh Works. The engines built were 21C11 to 21C20 between December 1944 and June 1945. Although ordered under the SR, the final batch, made up of 10 more engines, was delivered under British Railways (BR) between September 1948 and April 1949. Due to this, these locomotives only received their BR numbers (35020 to 35030). 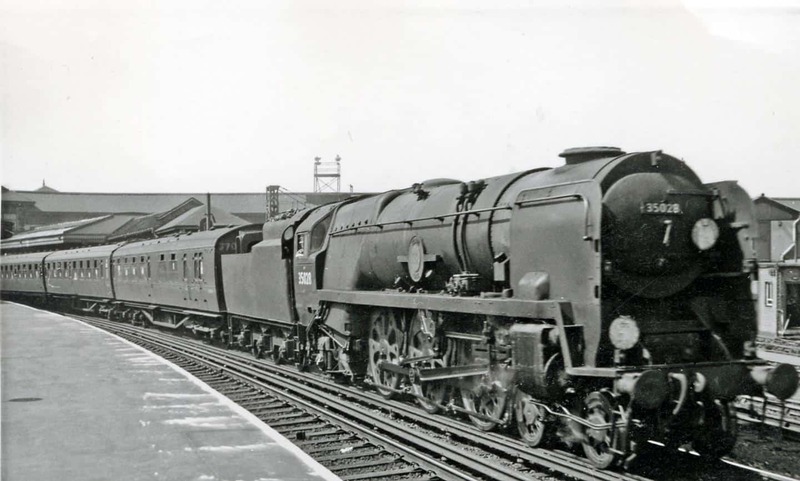 Construction was spread across all three ex-SR Locomotive Works, with the frames made at Ashford, boilers and tenders made at Brighton and final erection and other components done at Eastleigh. Although World War 2 meant the heavy boat trains had suspended, there was still plenty of work for the class to do. Hauling express passenger trains to Southampton and Exeter showed the power and capability of the class, even when fired on poor quality coal. After the war, many express trains were restored, such as the Bournemouth Belle Pullman, which the Merchant Navies hauled until the late 1960s. The Merchant Navy class suffered a few issues, most of which were caused by the unorthodox design features. The first problem was that the engines were prone to wheelslipping. This has been linked to their adhesion but also their second issue, maintenance. Bulleid’s own design of chain valve gearing was enclosed in a oil bath, which was known to leak. 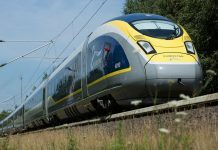 The leaking oil would drip onto the track, causing a slippery surface for the wheels to slip. The oil from the bath, but also oil from the axleboxes, soaked into the boiler lagging and would catch fire when sparks from the boiler or wheels ignited it. Although they ran well on poor coal, their consumption was relatively high. This was noted when compared against similar powered engines from the ‘Big Four’. The last issue which was never fully rectified in original form was poor visibility caused by smoke and steam. The Air Smoothed casting and large diameter chimney caused smoke to drift downwards into the driver’s view. Various sizes of smoke deflectors had been trialled, but none seemed to fully resolve the problem. In 1953, an accident, which lead to an investigation, discovered a flaw in the design of crank axle on the whole class. This lead to the immediate withdrawal of the class while new crank axles to a modified design were manufactured and fitted. Following on from these issues plus with more reliable classes in use, BR had to decide on the faith of the Merchant Navies. 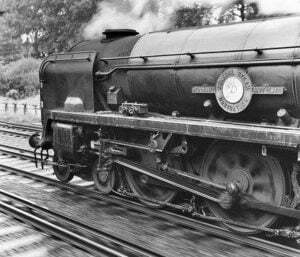 Carrying out further improvements was made difficult with Bulleid leaving the Southern Region of BR in 1949. 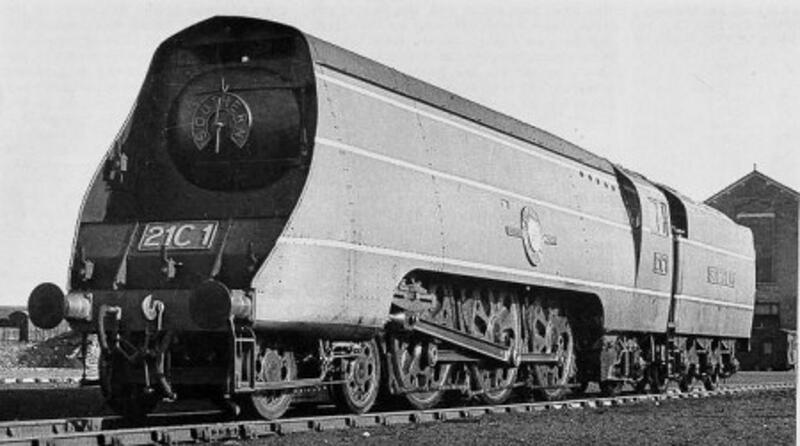 Plans were proposed to scrap the whole class in favour of the new Standard 7 ‘Britannia’ Class, but these were dropped in favour of rebuilding the class. This decision was made based on the a few features the Bulleids had which were good, such as their boiler. Jarvis, who replaced Bulleid, was given the task of rebuilding the whole class, which started with 35018 “British India Line” in 1956. Features such as the Chain Valve Gearing and Air Smoothed casting were removed, but the BFB wheels and Thermal Syphons were retained. Although the appearance of the class was changed drastically, they kept the same power as before. Maintenance had been reduced, but hammer blow had been increased was the main differences. 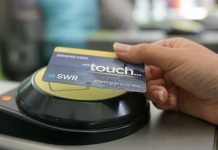 The main cause of decline and withdrawal of the class was down to the South Western Mainline changing from Southern Region control to Western Region. By the early 1960s, the Western Region had introduced their Diesel-Hydraulic ‘Warship’ class, which were allocated to hauling express passenger trains over the South Western Mainline, leading to the withdrawal of the Merchant Navies. 1964 saw the first withdrawal, this being 35002 “Union Castle”, which like the rest of the class was in good condition following the rebuilding not too long ago in the late 1950s. Thankfully, just over a third of the class remain today. Based on the Merchant Navy class design, the West Country and Battle of Britain class were a scaled down version of the Merchant Navies. They had all the same unorthodox design features, but reduced in size to form engines with lighter axle loading. The weight of the Merchant Navies restricted them from many routes, leading to the need for the West Country and Battle of Britain class to run on these routes. Due to War World 2, the first batch (of 20, but later increased to 30) was ordered in April 1941 but the first engine appeared in May 1945, this being 21C101 “Exeter”. 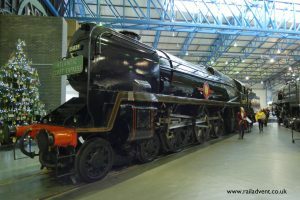 The North British Locomotive Company built the boilers for this batch, Brighton Works constructed the rest of the locomotives. 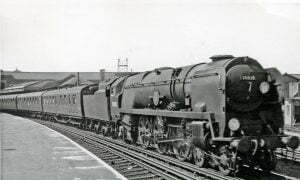 Before the first batch had even started, a second order for 10 engines had been placed to be built at Brighton. 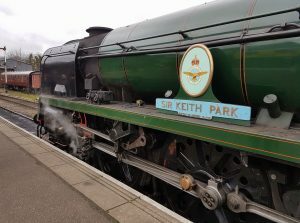 70 engines had been built under SR ownership, 50 named after towns and cities in the West Country and 20 named after planes, squadrons and people related to the Battle of Britian. After BR was formed and SR absorbed into it, another 40 engines were built across three batches. 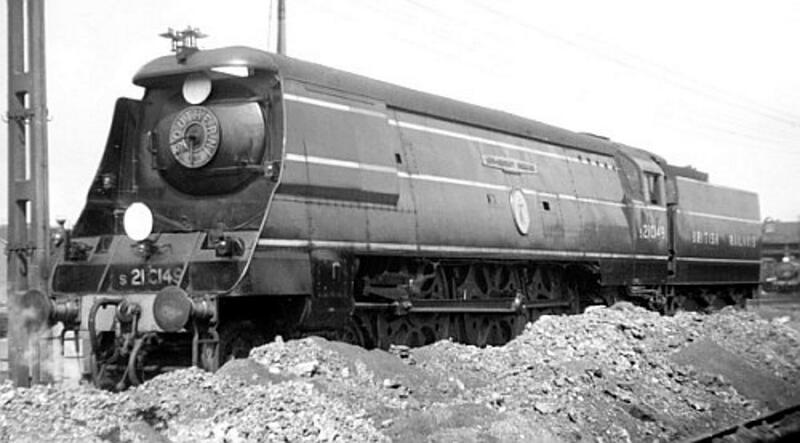 The last engine, which only received its BR number, was 34110 “66 Squadron” built in January 1951. 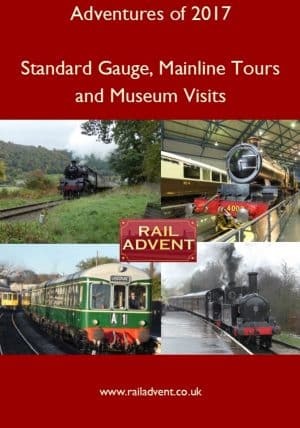 The good route availability of the engines meant they could be used on various lines across the Southern Railway and Region, from Plymouth to Kent to secondary lines to Barnstaple and Bude (which both had engines named after them). Like the Merchant Navies, they would haul both passenger and freight trains. The West Country and Battle of Britain class suffered the same issues as their larger version, which rebuilding of 60 engines to the same layout as the Merchant Navies solved. Both electrification and denationalisation of the Southern Region lead to the withdrawal of the whole class. Many of the rebuilt engines made up some of the first engines to withdrawn despite running low mileage after rebuilding. The last member to be built was one of the 10 engines withdrawn in 1963 at 12 years old. Of the 110 built, 20 (10 originals, 10 rebuilds) have survived into preservation. Most of these spent some time in Barry Scrapyard before being restored by groups and heritage lines. A large number of the class has been saved, this being 11 members. 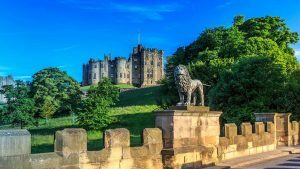 In this section, we will focus on the members undergoing restoration or overhaul but also provide information on the current status of all members. 35006 (21C6) “Peninsular & Oriental S. N. Co.” – Operational on the Gloucestershire Warwickshire Steam Railway, owned by the 35006 Locomotive Company Ltd. 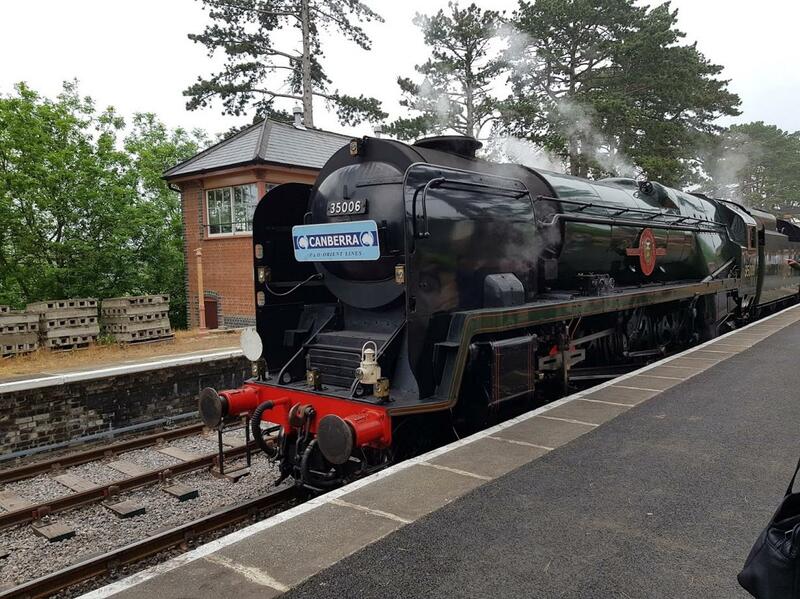 Returned to hauling passenger trains in May 2016. Carries BR Lined Green with Late Crest livery. 35009 (21C9) “Shaw Savill” – Awaiting restoration, owned by Ian Riley. 35010 (21C10) “Blue Star” – Awaiting restoration at the Colne Valley Railway, owned by the British Enginemen Steam Preservation Society. The society is currently restoring another engine before they start on 35010. 35011 (21C11) “General Steam Navigation” – Undergoing restoration at Sellinge, Kent to original condition. 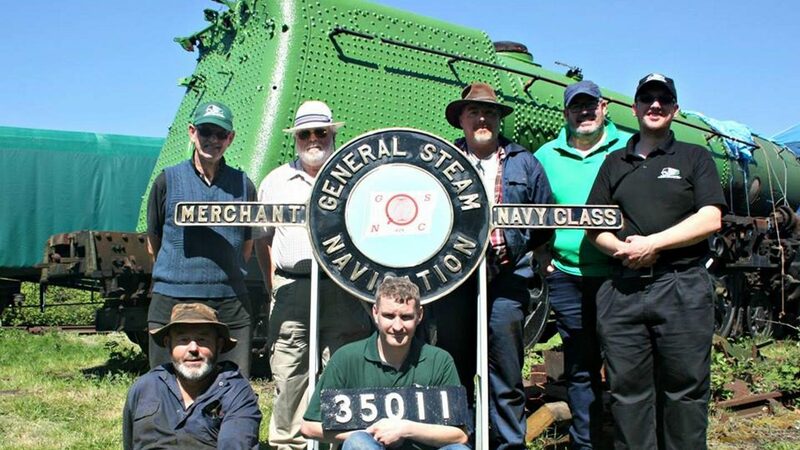 Owned by the General Steam Navigation Locomotive Restoration Society. The society purchased 35011 in August 2015, and have started to carry out restoration work. 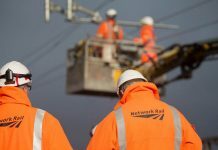 Work has started on changing the Flawed Plain Axle into a Crank Axle, and working parties formed to prepare the locomotive for further work and protect exposed components. Many new components have been manufactured including Nameplates. Annual membership to the society only costs £10, with the membership fee going towards restoring 35011. Latest information from the society can be found here. 35018 (21C18) “British India Line” – Operational on the mainline, based at Carnforth MPD and owned by West Coast Railways TOC. Steamed for the first time in preservation in May 2017, hauling its first trains in Autumn 2017. Carries BR Lined Green with Late Crest livery. 35022 “Holland America Line” – Awaiting restoration at Crewe Diesel Depot, owned by Icons of Steam. 35025 “Brocklebank Line” – Awaiting restoration at Sellinge, Kent. 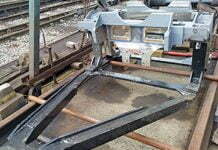 Some restoration work was carried out at previous site the engine was based at. 35027 “Port Line” – Awaiting overhaul at Crewe Diesel Depot, owned by Icons of Steam. 35029 “Ellerman Lines” – Sectioned to show internal workings. Displayed and owned by the National Railway Museum. 20 engines of the class survived the cutter’s touch, 10 engines in original form and 10 in rebuilt form. 34007 (21C107) “Wadebridge” (Original) – Awaiting overhaul at and owned by the Mid Hants Railway (The Watercress Line). Boiler ticket expired in 2016. Want to see 34007 in steam sooner? Donate here. 34010 (21C110) “Sidmouth”(Rebuild) – Undergoing restoration at Herston Works. 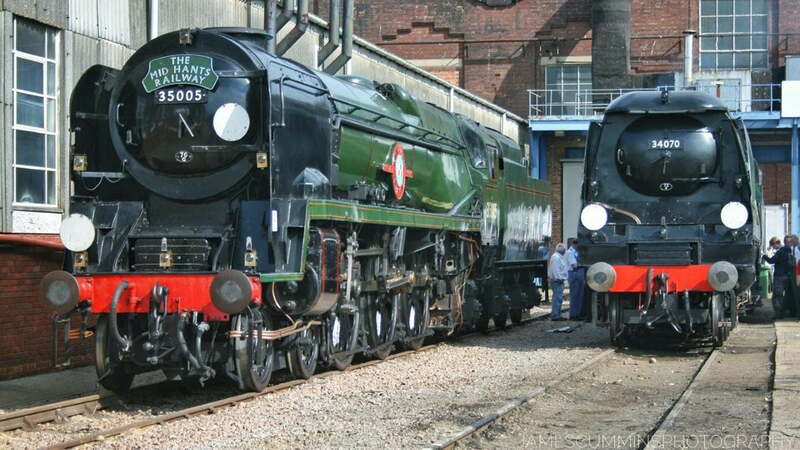 Owned by Southern Locomotives Ltd, who have restored seven locomotives, most of these Bulleids. 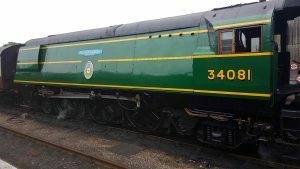 34010’s Boiler moved to the North Norfolk Railway in late 2017 for restoration to begin. Fancy joining Southern Locomotives and help to restore 34010 or maintain one of their other Bulleids? More information can be found here. 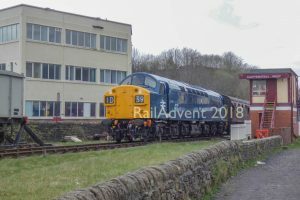 34016 (21C116) “Bodmin” (Rebuild) – Awaiting overhaul at Carnforth MPD. When overhauled, 34016 will operate mainline tours. 21C123 (34023) “Blackmoor Vale” (Original) – Awaiting overhaul at the Bluebell Railway. One of two ‘Light Pacifics’ preserved from BR, not being brought by Barry Scrapyard. Carries SR Malachite Green with Sunshine Yellow Lining. 34027 (21C127) “Taw Valley” (Rebuild) – Operational on the Severn Valley Railway, owned by a private owner. Carries BR Lined Green with Late Crest livery. 34028 (21C128) “Eddystone” (Rebuild) – Undergoing overhaul at Herston Works, owned by Southern Locomotives Ltd.
34039 (21C139) “Boscastle” (Rebuild) – Undergoing overhaul at the Great Central Railway. 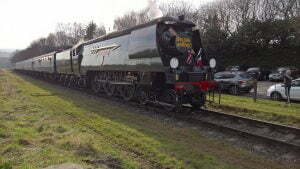 34046 (21C146) “Braunton” (Rebuild) – Operational on the mainline, owned/maintained by Icons of Steam. Currently running as scrapped class member 34052 “Lord Dowding”, mainline boiler ticket expires in 2023. Carries BR Lined Green with Late Crest livery. 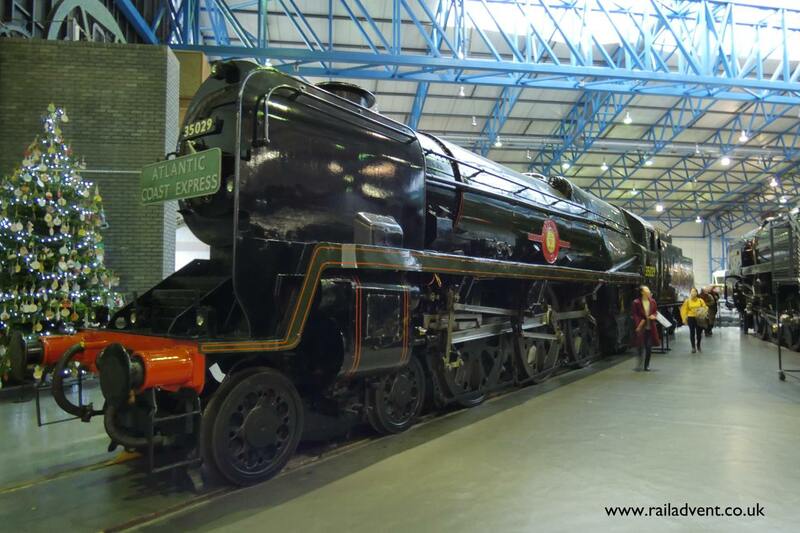 34051 (21C151) “Winston Churchill” (Original) – Static display at and owned by the National Railway Museum. Carries BR Lined Green with Late Crest livery. 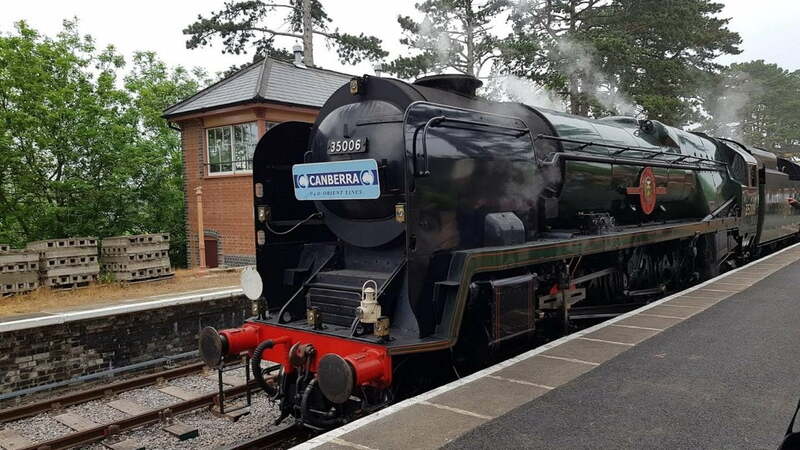 34053 (21C153) “Sir Keith Park” (Rebuild) – Operational on the Swanage Railway, owned by Southern Locomotives Ltd. Carries BR Lined Green with Late Crest livery. 34058 (21C158) “Sir Frederick Pile” (Rebuild) – Awaiting restoration at the Mid Hants Railway (The Watercress Line), owned by a private owner. 34059 (21C159) “Sir Archibald Sinclair” (Rebuild) – Undergoing overhaul at the Bluebell Railway. Boiler receiving work at South Devon Railway Engineering Ltd.
34067 (21C167) “Tangmere” (Original) – Undergoing overhaul to mainline standard, based at Carnforth MPD. 34070 (21C170) “Manston” (Original) – Undergoing overhaul at Tyseley Locomotive Works, owned by Southern Locomotives Ltd.
34072 “257 Squadron” (Original) – Undergoing minor repair work before entering traffic on the Swanage Railway. 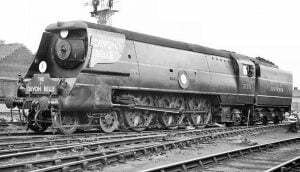 34073 “249 Squadron” (Original) – Awaiting restoration at Carnforth MPD. 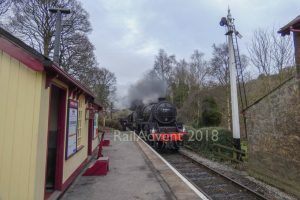 34092 “City of Wells” (Original) – Operational on the East Lancashire Railway. 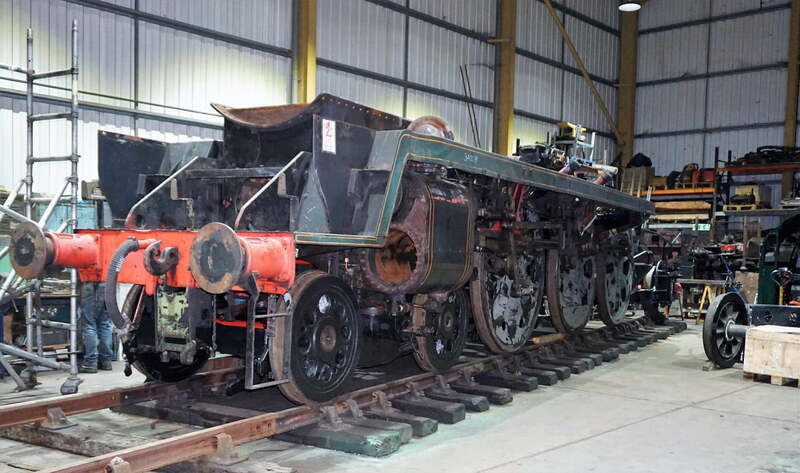 The East Lancashire Railway launched an appeal to purchase 34092 from its current owners. The engine is unique in being fitted with a Giesl ejector, which was trialled by BR on a few members of the class. Carries BR Lined Green with Early Crest. Want to help the East Lancashire Railway purchase 34092? More information can be found here. 34101 “Hartland” (Rebuild) – Currently undergoing an overhaul at the North Yorkshire Moors Railway. 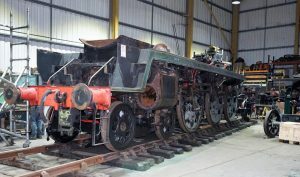 The boiler is almost complete at South Devon Railway Engineering Ltd, rolling chassis virtually completed at North Yorkshire Moors Railway, where the engine will be based when back in steam. 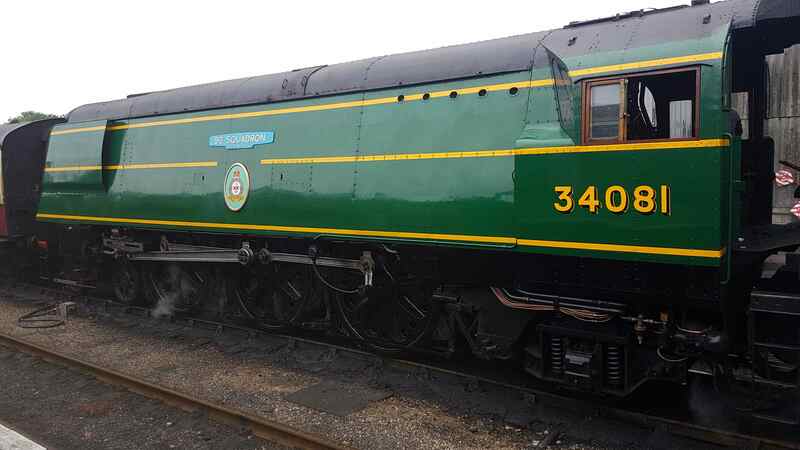 34105 “Swanage” (Original) – Undergoing overhaul at the Mid Hants Railway. 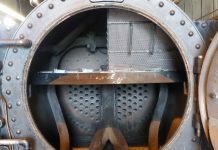 Boiler is primary focus at Ropley, with an aim to have the engine in steam over the next few years. We hope you enjoyed reading this week’s very long Class Information. Next week will see the next edition of the Sole Survivor series released, with the next Class Information being published on Friday the 22nd of June.